The tremendously diverse vastness of Mexico provides visitors of all kinds with remarkable natural splendor and untold reward throughout the year. The winter is a stand-out season, though, in the World Heritage highland forests of Michoacán and the marine enclaves of Baja California. As the days grow shorter, determined creatures ranging in size from 3-4 inch featherweights to school bus-sized 30-40 ton giants make their way in by air and sea, delighting and mystifying human observers. Join Monarch butterflies and eastern Gray whales in their annual sojourn and learning about conservation issues that threaten the future of these precious ecosystems. Explore historic Morelia, kayak the Sea of Cortez, and snorkel with wild sea lions. Along the way, expert naturalist guides will reveal many charms of Mexico, proven here to draw repeat visitors from great distances. 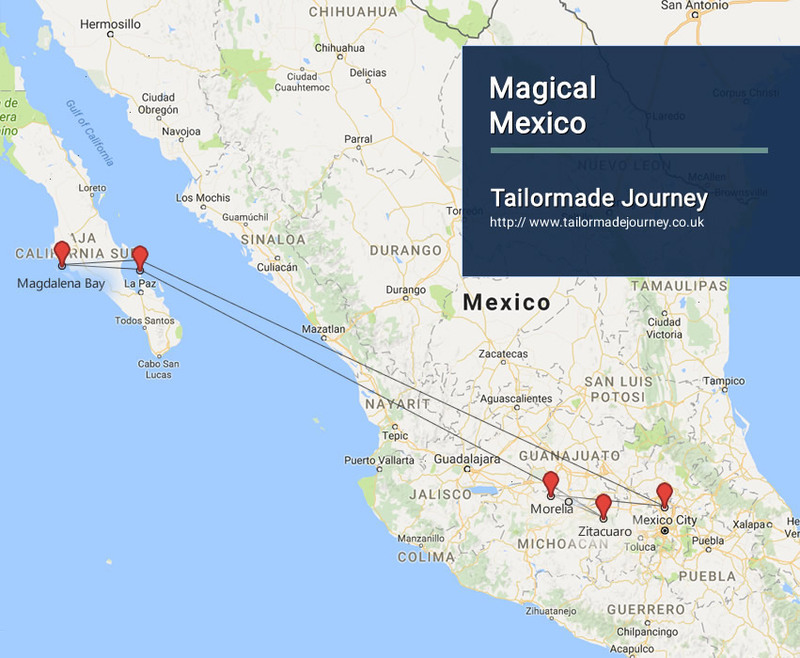 Arrive Mexico City 1> Flight Morelia 1 Night > Drive Zitacuaro 3 Nights > Drive Morelia 1 Night > Flight La Paz 2 Nights >Drive Magdalena Bay 1 Night > Drive La Paz 1 Night > Flight Mexico City 1 Night & Leave . Transferred to Mexico City Airport to board flight for Morelia.Upon arrival in Morelia Airport, your guide will welcome you to one of Mexico’s most endearing urban centers and the capital of Michoacán state. Relax before the next day’s travel onward to Rancho San Cayetano gateway to the Monarch Biosphere Reserve. Overnight Stay at the Hotel in Morelia. After breakfast in Morelia, you will journey toward the rugged and verdant winter home of the brilliantly-colored Monarch Butterfly. Spend the night among pine and fruit trees, outside the reserve before two days of exploration among the migrating Monarchs. Overnight Stay at the Hotel in Zitacuaro. This morning your guide will drive you approximately 35 minutes to the first sanctuary. Upon arrival in El Rosario, you will leave the vehicle behind to walk a groomed but at times fairly steep trail into the fir tree forest favored by the butterflies. As you continue along the trail, note how the forest thickens toward on approach to the destination you share today with 60 million to more than a billion butterflies congregating in the forest after eight months and four generations of migration. The sun warms and lights their wings to reward visitors with a unique and remarkable display of light and color. Your expert guide will ensure that you experience this unparalleled and mysterious phenomenon as more than simply an extraordinary spectacle; we pause to discuss ecology, natural history and conservation issues in the sanctuary. Enjoy a picnic lunch today in a nearby forested location. After lunch, you may decide to return into the reserve or explore another depending on local conditions and interest. You will depart the sanctuary at 4:30pm for the return drive to your lovely hotel. After time for showering and relaxing, join your expert guide for a 7:00pm dinner at the hotel where you will have additional opportunities to discuss your experiences in the sanctuaries. (Please note: the reserve altitudes vary from 8,000 – 10,000 ft. above sea level and these encounters require the ability to walk for over an hour along a steep incline that can be considered moderately strenuous). After breakfast this morning, you will board your private vehicle for the approximately one-hour trip to the Cerro Pellón Reserve (reserves are selected based on butterfly concentration and are therefore subject to change). Upon entering the reserve, you will have the option to ride horseback – or walk if you prefer – for approximately an hour to another phenomenal butterfly gathering. In the quiet of the forest, you can hear the beating wings of these delicate creatures. Enjoy a picnic lunch in a nearby forested location. After lunch, you may decide to return into the reserve or explore another depending on local conditions. You will depart the sanctuary at 4:30pm for the return drive to hotel. Overnight Stay at the Hotel in Zitacuaro. Today, you will depart from the Butterfly gateway of Zitácuaro for historic Morelia, recognized globally for its intellectual traditions and eclectic mix of the medieval and Renaissance spirits. Enjoy a half-day tour of the city, visiting the central square and seeing masterfully restored 17th and 18th century colonial mansions. This morning, your driver will provide you with a private transfer to Morelia International Airport for onward travel to the magnificent desert and ocean ecology of Baja California Sur. Arrive La Paz to relax in your historic boutique hotel located a short walk from the waterfront promenade, or malecón. Overnight Stay at the Hotel in La Paz. Today we sea kayak or snorkel (arriving by high-speed motor boat) at Espiritu Santo Island. Along the way, your expert guide will provide an orientation to provide beginners with important information on safety and the basics of operating a sea kayak. Hop into the turquoise waters to paddle beneath volcanic cliffs until lunchtime, when a beach picnic awaits. A natural history walk follows and a ride to a sea lion island colony. There is no thrill like swimming and snorkeling among sea lions in the wild. Return to your elegantly appointed B&B in La Paz for the evening. After breakfast on the east coast of Baja, depart the Sea of Cortés and head across the peninsula for the open Pacific. Your driver will meet you for a private transfer to Magdalena Bay (approximately 3.5hrs) for the first of two whale watching trips in a protected pacific lagoon area. Although Gray whales were once common throughout the Northern Hemisphere, there now appear to be only two North Pacific groups. The “eastern” of these spends the summers feeding in the Bering Seas, traveling to Baja each winter. This journey, estimated from 9,300 to 12,500 miles in length, is one of the longest annual migrations undertaken by any mammal. During your visit to these same waters, you will stay in a local fishing village, where you can also enjoy fresh seafood in abundance. Overnight Stay at the Hotel in Magdalena Bay. Today we spend another day in Magdalena Bay whale watching and then return to La Paz. Wake for a hot Mexican breakfast before the second whale-watching trip. Over the last ten years, many of our guests have been thrilled by the whales swimming directly beside the boats, allowing for the extraordinary existence of making physical contact with these magnificent creatures. Enjoy another lunch on the Pacific coast after the morning’s trip and return to to La Paz for a final night in Baja. You will be back in La Paz around 4pm, with time to stroll the waterfront and ponder these tremendous distances travelled before making your own trip back home. Transferred to Mexico City Airport to board flight for Onward Journey.